BREAKING NEWS: Cambridge Audio to launch Blu-ray Disc player at CES | What Hi-Fi? 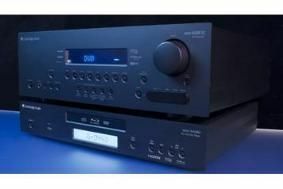 The 640BD is due for release in early 2009 and is designed to partner CA's new Azur 640R V2 7.1 AV receiver ($1799), also shown in the picture. Cambridge Audio's first BD player has internal decoding for Dolby Digital EX, DTS-ES, Dolby Digital Plus, Dolby TrueHD and DTS-HD surround sound. It delivers bitstream output via HDMI 1.3a from all the latest high-definition audio formats, and comes with a full set of 7.1 analogue outputs, Ethernet, Toslink and SPDIF connections. The 640BD will also upscale DVDs to 1080p, supports 24fps (frames-per-second) on Blu-ray discs and is Profile 2.0 compatible out of the box. The matching Azur 640R V2 multichannel receiver uses the latest Cirrus Logic/Crystal chipset with twin 32-bit DSPs to enable full support for Dolby Digital Plus, DTS-HD High Resolution, Dolby TrueHD and DTS-HD Master Audio surround sound. Power output is 7 x 100W, and it has three HDMI inputs, video upconversion for all sources to HDMI, auto set-up and LipSync audio delay. We'll be chasing Cambridge Audio for UK pricing on the new models just as soon as our feet hit the ground in the States, and will report back as soon as we know any more.